If you ignore the horribly contagious disease, today has been a great day! B has chickenpox, so him and I stayed at home from nursery and work and spent all day together. Not sure when was the last time I had the chance to spend all day with only one of my boys. We said goodbye to T and daddy and dived straight into the Duplo box. The box is so big, B can actually fit in it! We built a train, a tunnel, a red train station, a yellow train station and even a green one. We took many passengers on and off. Then poo happened! We went for a bath, a long one with fish, penguins, squids, turtles and not one but 4 boats… all for B. No sharing! He was over the moon! After a quick visit to the doctor, lunch and a nap we went back to a little bit more playing. We made a wristband! We coloured it, cut it and then… put it on a giraffe’s neck. Why not! 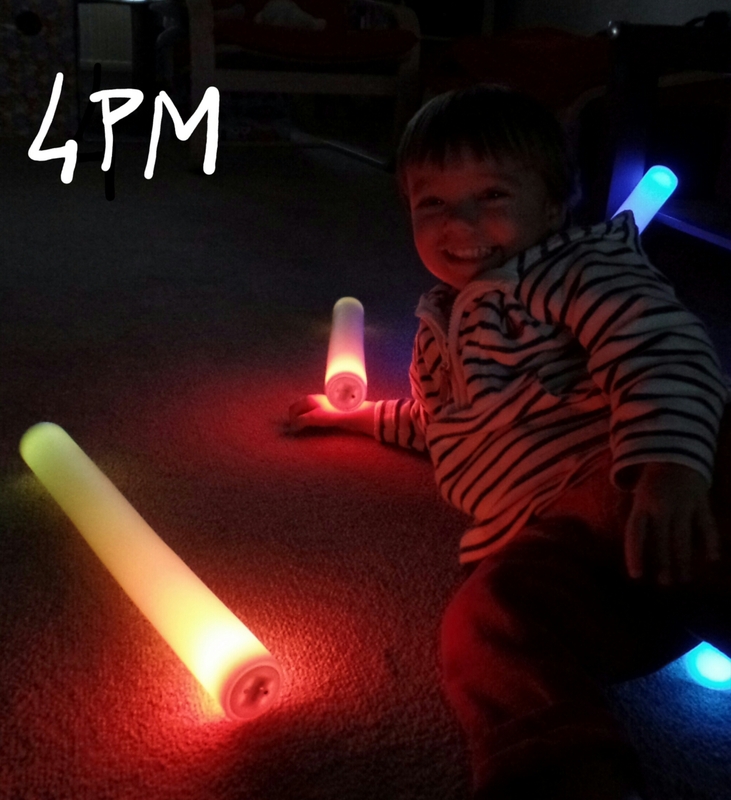 It gets dark very early now, but that’s not a problem if you have light tubes to play with! Look at the smile on this little boy’s face… priceless! 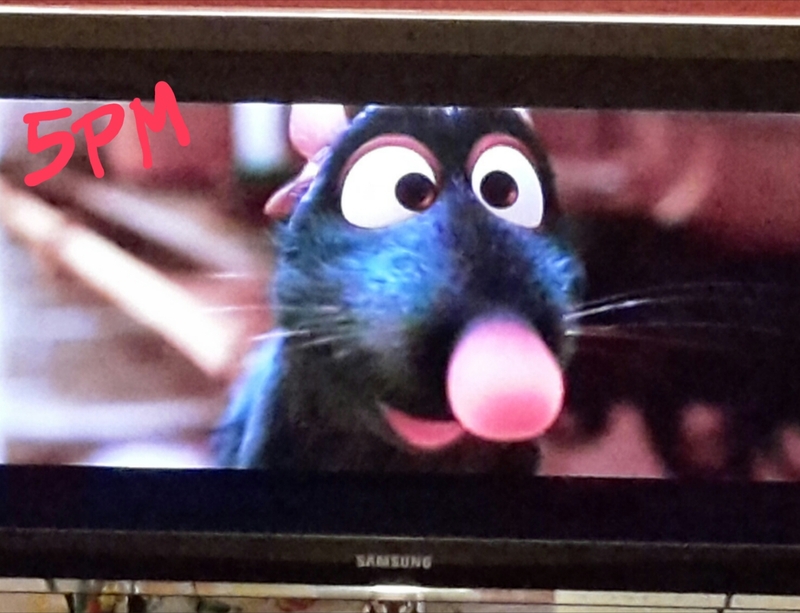 By 5 PM we were ready to slow things down, so B picked up the Ratatouille DVD. He had never saw it before, but he likes “topi”, so he thought it was a good choice… I agreed! We didn’t have time to watch it all, but we really enjoyed the first bit and I stop myself from explaining the difference between topi and ratti. I didn’t want to spoil the fun, you see. We definitely have to watch this again and maybe, just maybe, invite T as well. At 5.15 grandad arrived. He’s taking over babysitting duties tomorrow so I can go back to work… my day home alone with B was over. As T had chicken pox this week, we had to come up with a plan to keep him out of nursery but not to miss too many working days. In a desperate moment of madness, I suggested my 25 year old brother-in-law, Kieran. Why madness? Well, before this week he had no experience of children or toddlers. He had never even changed a nappy and my plan was to leave him with a sick grumpy toddler. As I said, madness. He was perfect! The weakness on his babysitting CV was his strength. Because he had no experience of toddlers, he listened to every word I said. We had a schedule, which he followed to the letter; a simple menu, which worked well; and a quick nappy masterclass to prepare him for the inevitable. T didn’t even poo on the first day. What a welcoming child! Kieran is not really interesting in jobs in childcare, but I would give him a great reference. He spent 4 solid days playing with trains. Only trains! But he never complained. He made T dance, eat, sleep, play and draw. He made sure he had lunch at the right time and a clean nappy before afternoon nap. In 4 days he only made one mistakes: broke a babybel in half (T went nuts!). When it was time to say goodbye on Friday night, T said “bye bye” then pointing at Kieran he added “Kieran mine”. I couldn’t have chosen a better baby sitter for the week. 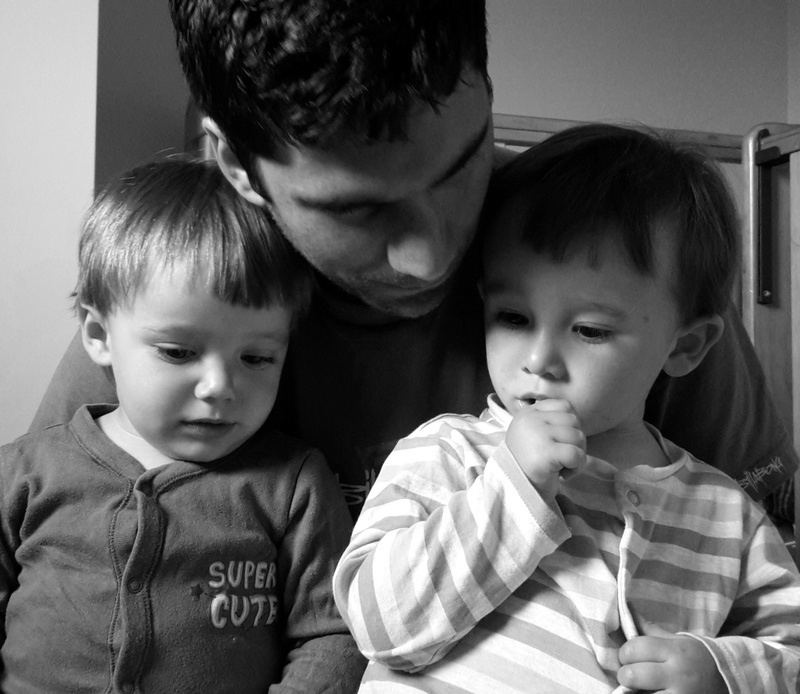 I thought chicken pox was going to be a nightmare but I was wrong, someone up there has a masterplan for me and my boys and He always surprise us. I thought we had ticked the box. I believed we crossed the river never to come back. I thought we had been to battle and come back victorious… but I was wrong. Chicken pox is back and it is taking no prisoners! Last year both boys had chicken pox. We had one falling ill with it and, as by medical school textbook, the other followed exactly 15 days later. We were lucky it wasn’t too itchy. We didn’t have any major scaring and the main problem was the waking up at night for the cough (apparently a very usual symptom, who knew?!). If you read this blog though, you know we are used to waking up during the night. With or without out highly infectious diseases! As everybody knows, being a virus, you build an immune system to chicken pox so you can’t get it again. Or at least I thought so… in extremely rare cases, only on a leap year, if you live at a certain latitude and altitude and on a new moon night, your child may get it again!?! Actually there’s a more scientific explanation for it, but I’m not interested. I know it’s all been organised to annoy me and no one is going to change my mind about it! Now let’s see if B gets it AGAIN as well… keep reading! Can you survive parenthood without Calpol? 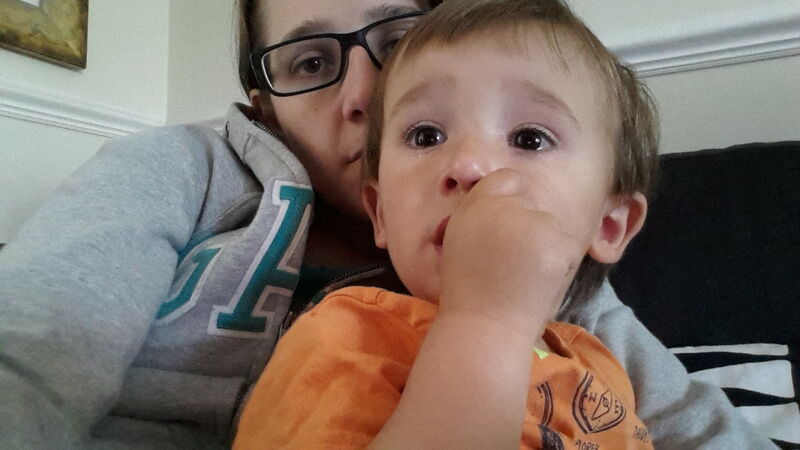 Cuddles – we have reached 10 episodes of Thomas & Friends in a row once! A few weeks ago one of my colleagues was telling me about feeling his son kicking for the first time. That brought me right back! He confessed how what worries him the most is the fact that he won’t know what to do if (or when) the baby becomes ill. On the spot I told him not to worry and that lots of help and support is always available, but the more I think about it, the more I found that I was wrong. He will worry about it and that will make him take the right decisions. Do I need to call a doctor? Do I need to give him some more milk? Babies cannot talk and they cannot tell you if it hurts or where it hurts, they can only cry. It’s very frustrating of course, but it’s also empowering. You are in charge. You make the decision! 1) Driving to the doctor with a very unhappy, sick and feverish boy… and seeing him improve and cool down in the waiting room. The doctor told me he had never seen such a healthy toddler in his life! 2) Wake up in the middle of the night with a crying child and after 20 minutes of uninterrupted scream, give him some medicine (just in case)… to then find out all he wanted was food and proceed to feed him 8 biscuits and a cup of milk. 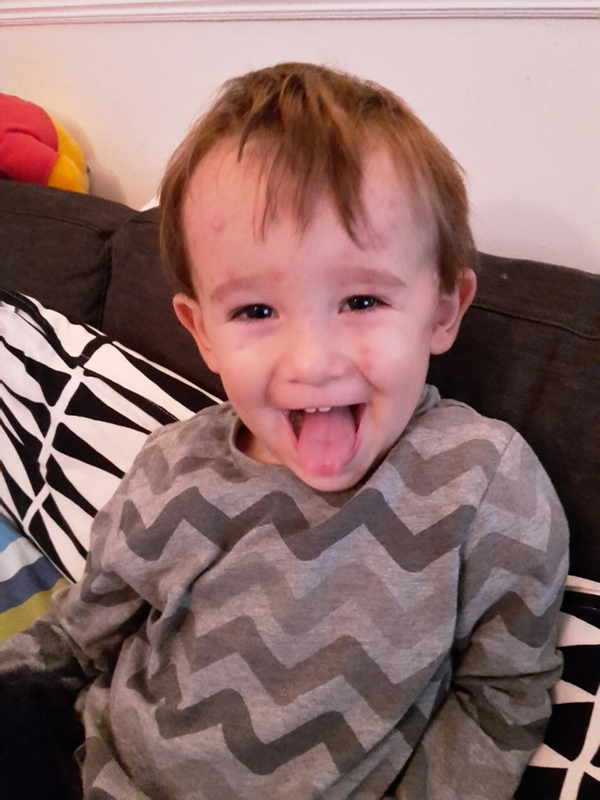 3) Be absolutely convinced that those small spots on my feverish child were mosquito bites… to then find out he had had Chicken Pox and we didn’t notice! 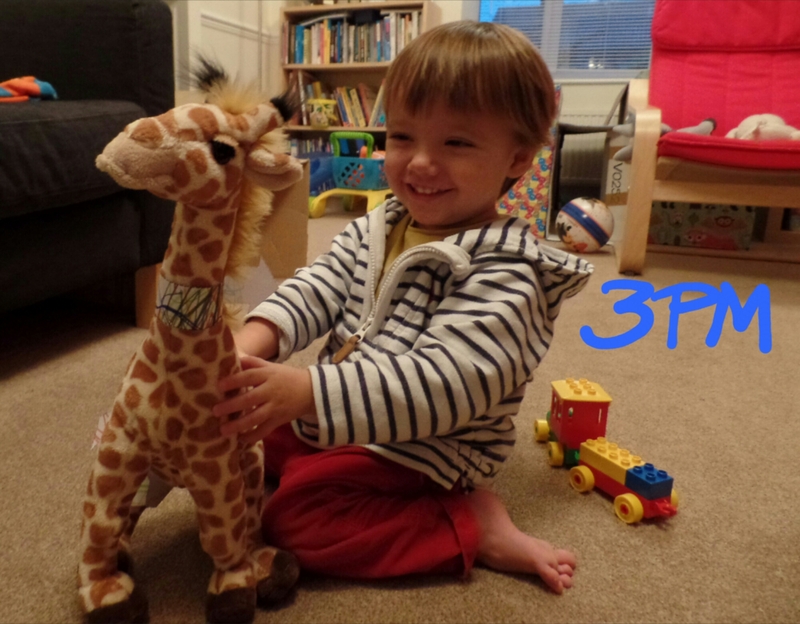 4) Sending one child to nursery despite being sick at breakfast and hoping for the best… and being called 2 hours later to pick up the other one for being sick! 5) Rushing B indoors after falling in the garden, to wash his leg and clean his wound. Worrying about bacteria and infections… to then find out that all you need is a plaster. Of course, he is a toddler he forgets anything within 3 seconds and loves plasters! Despite all the mistakes, the most important thing is that they survived 23 months and they will survive 23 more. After that I hope they will be able to tell me where it hurts or at least if it hurts. B has been ill for a couple of days now. He actually went to the doctor twice in two days. He has tonsillitis and then he had an allergic reaction to the antibiotics today. B is still not well and he has not been eating for 3 days now, so today I called the doctor simply to find out how long can toddlers carry on without eating (apparently two weeks!) The doctor though sounded really worried. Not about the lack of eating, but by the lack of drinking. We went to the doctor (again!) After checking that B wasn’t actually dehydrated yet, the doctor came up with lots of ideas to get him drinking again. In the end she said “try anything you want as long as he drinks something”. After trying everything in the usual list of drinks (water, juice, milk…), I went to the kitchen and got him some squash. I know many kids his age drink squash already, but I am not a big fan of it. After all it’s basically food colouring with a lot of sugar. It didn’t work anyway! I start to worry… We haven’t had a wet nappy since yesterday. Rules do not apply anymore! Anything liquid in my sight is now acceptable. He starts to drink a bit of my Earl Grey. Not great, but it’s a start. I try an ice lolly… no luck! I’m starting to panic so I drive to McDonald’s. All children love it, why not B? It works!! He drinks lots of Coke (not in the rulebook, but who cares) and we finally have a wet nappy. I have never been so happy to change a nappy! The day ends with chocolate milk. Yes, you read that right: chocolate milk. At the age of two there’s nothing as powerful as your mum’s voice. If she sings she can cure almost anything! The atrocious pain which makes a little boy scream and scream and scream, can be taken away by the magic of mum’s voice. The beauty of this is that, not only the little boy will feel better, but mummy will feel a hero. A superhero, in fact! Mummy is going to sleep!